Thanks for stopping by! I'll be sharing my latest project for the Online Sewing Match - Colette Patterns Negroni Men's shirt. 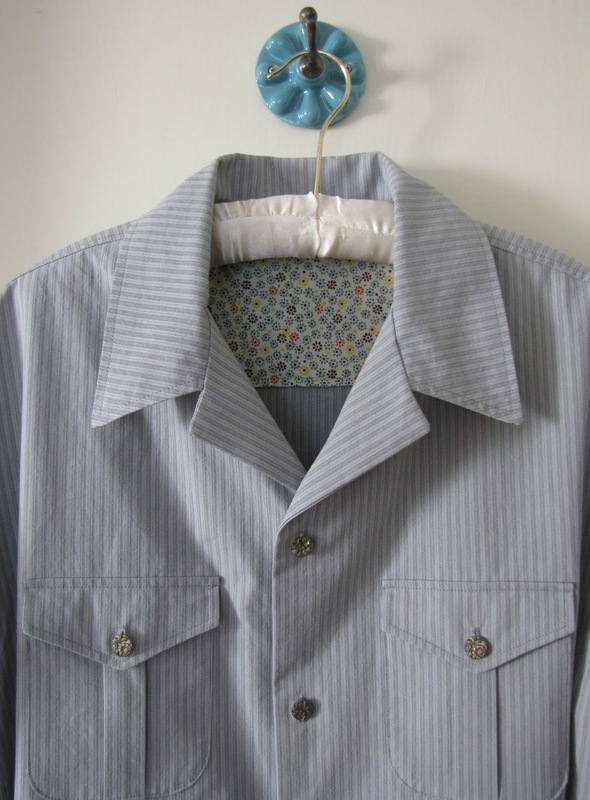 I have made a few simple shirts for my boys in the past few years but haven't made a tailored men's shirt since I was in design school over 20 years ago! It was a challenging project but the pattern really has wonderful instructions and I would recommend it to anyone who is new at making a tailored shirt. I especially love the packaging. The instructions are in booklet form with a spot in the back for the pattern. Very nicely designed! 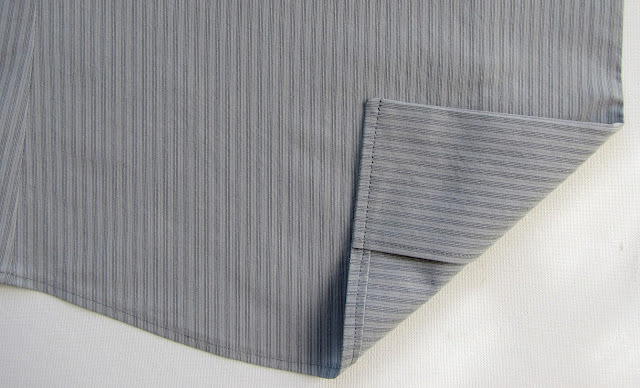 Fabric shopping in Seattle was a bust so I ended up ordering the grey stripe fabric from Mood fabrics. 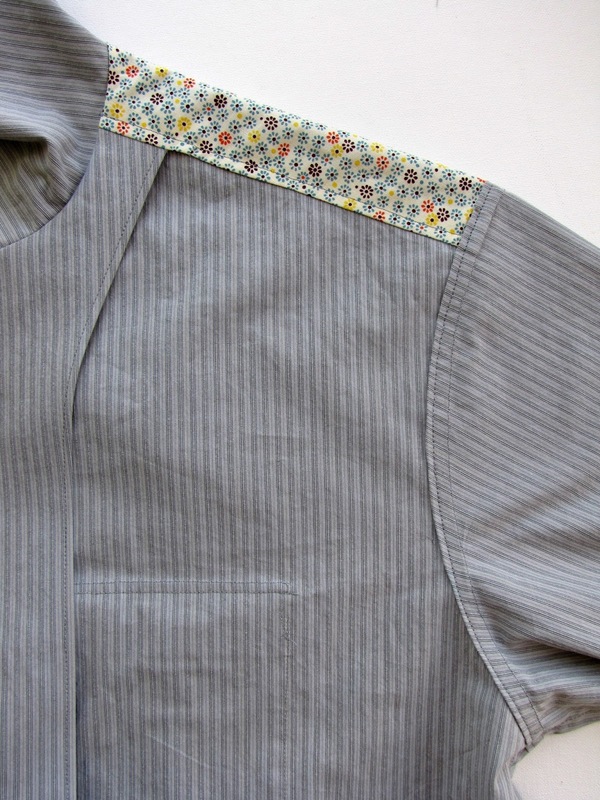 The contrast fabric that I used for the under collar, inside yoke, inside sleeve placket, inside cuff and pocket flap facing is from DS Quilts and I found it at JoAnn Fabrics. The buttons are antique pewter. I chose the long sleeve version and made tailored sleeve plackets. 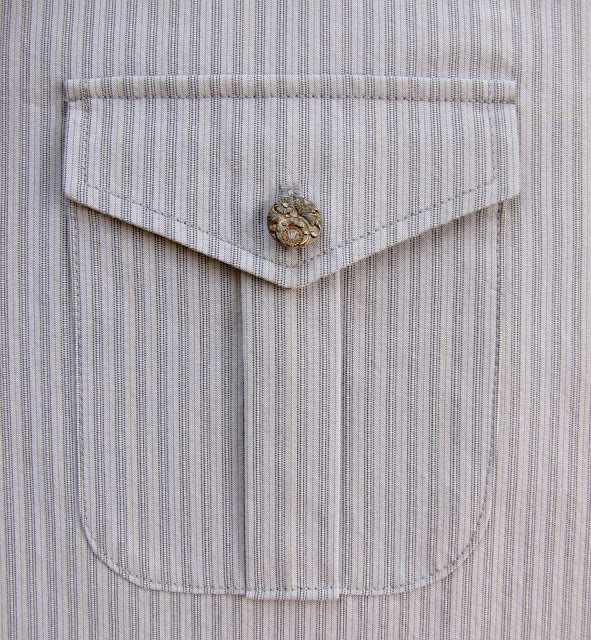 I used a contrast print for the inside cuff and inside the sleeve placket. The plackets were the most challenging part of this challenge for me. 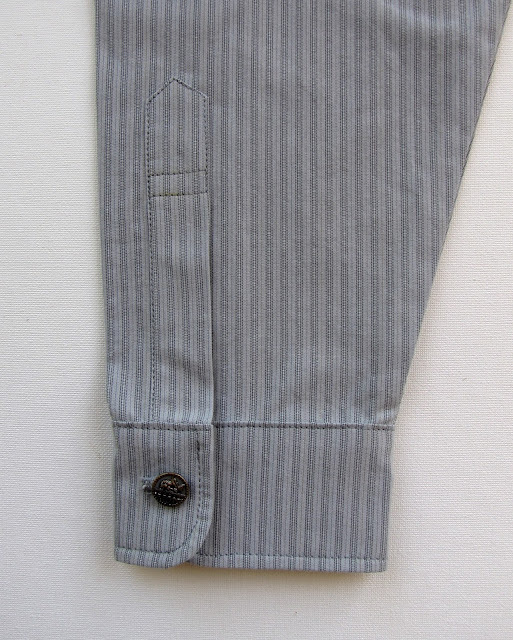 I added the center box pleat on the pockets. 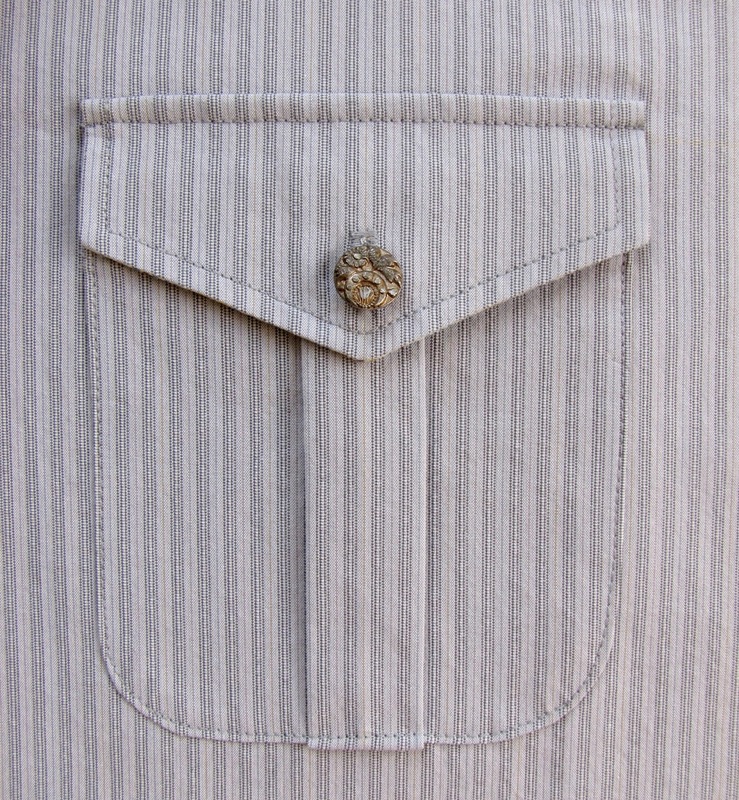 The pocket flap facing is a contrast print. I'm very happy with the collar and the way it lays so nicely! I omitted the loop at the collar but added a loop to the CB yoke (in the next pic). 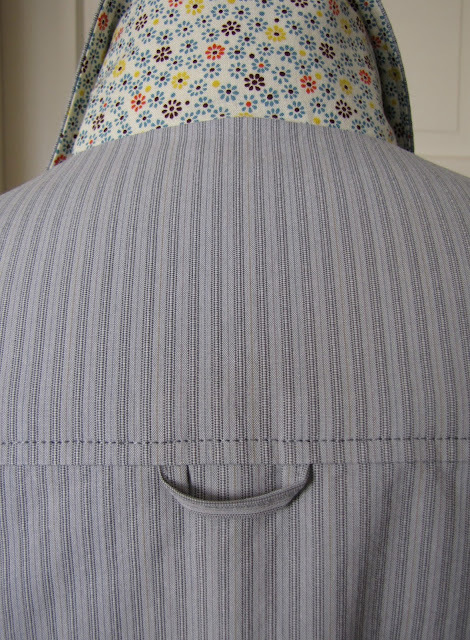 Back yoke with loop and contrast under collar. I clean finished the front facing edge for a nice finish. The armholes are finished with a felled seam and I used french seams for the undersleeve and side seams. 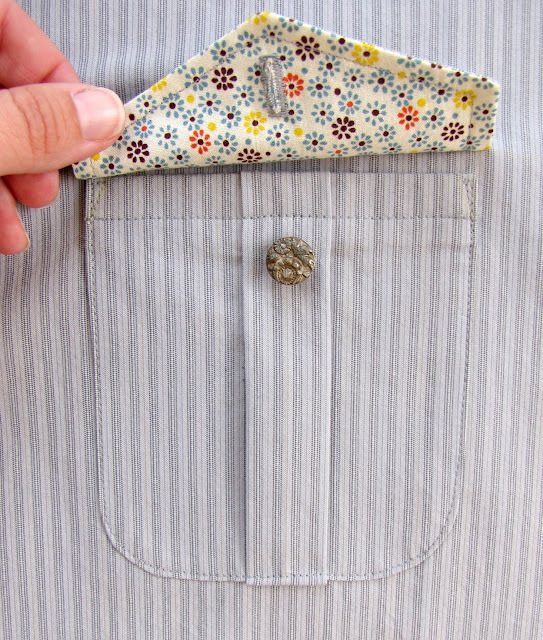 The pattern includes instructions for a cool way to clean finish the inside yoke! All in all I'm really happy with the shirt - The best part of making this shirt was during the "photo shoot". My hubs was looking at the cuff and said "Wow babe, this shirt is really well made!" OK, maybe he will get another one as long as I don't have to complete it in a weekend! * I followed the fabric requirements for the size XL, 60" wide fabric and had extra fabric. If I make this pattern again, I would lay out the pattern and determine the fabric requirements. * Measure your back yoke seam against the top upper back edge. 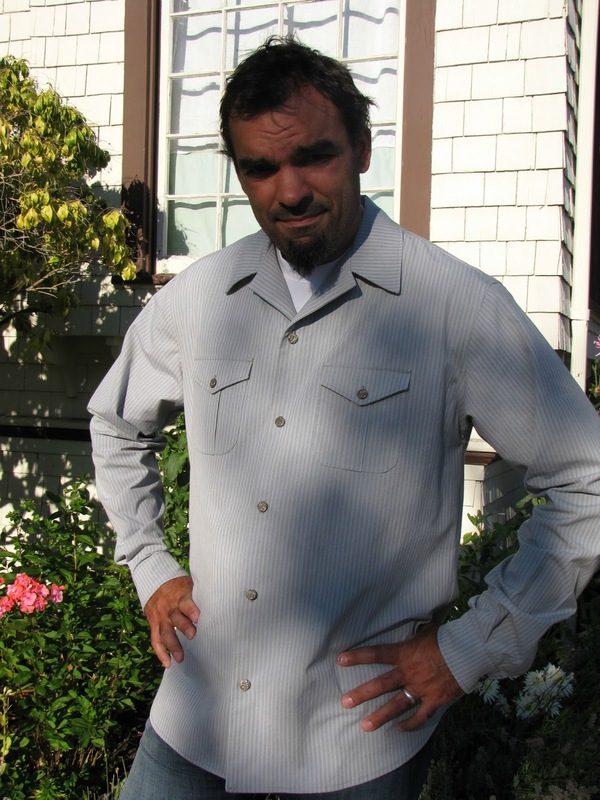 I found that the XL yoke pattern is larger than the top back shirt. You can fix this by making your pleats smaller. 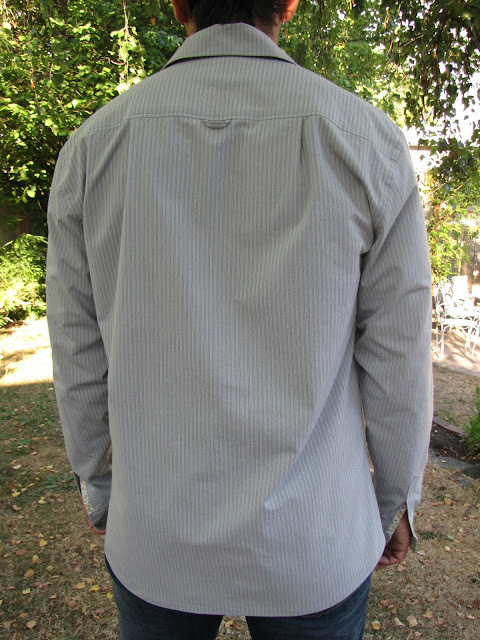 I made each pleat on the back shirt 1/4" smaller to accomodate the yoke. You made men's shirt so lovely! I'm very impressed! Beautiful shirt and your husband wears it so well! Wow, you are so talented! Can't get over it! absolutely amazing!! not in a million years would I even attempt this!! this looks really good and love the contrasting fabric. Your hubs is pretty lucky. I hope he appreciates all of the hard work! 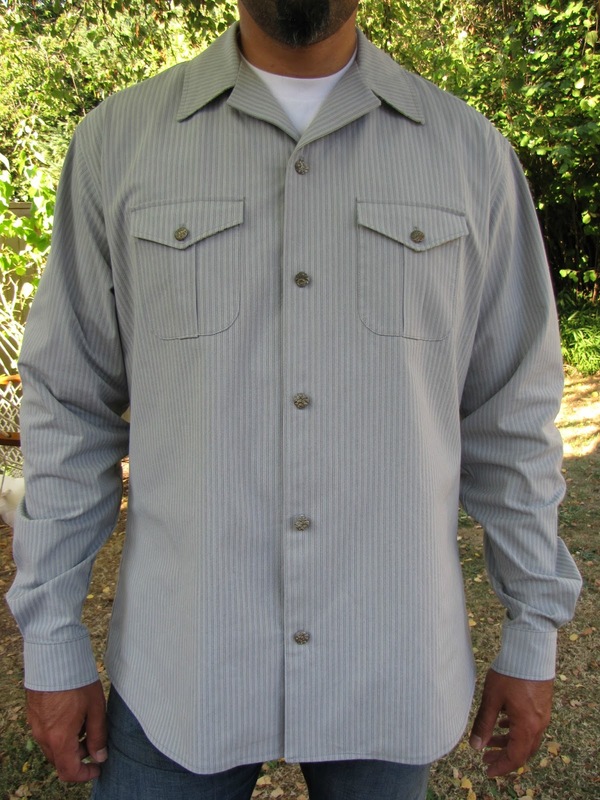 It is a great look shirt. Unbelievable - looks completely professional, and the cuff detail is my favorite, too. Great job!!! This shirt is a work of art!! Congratulations on a very impressive make. 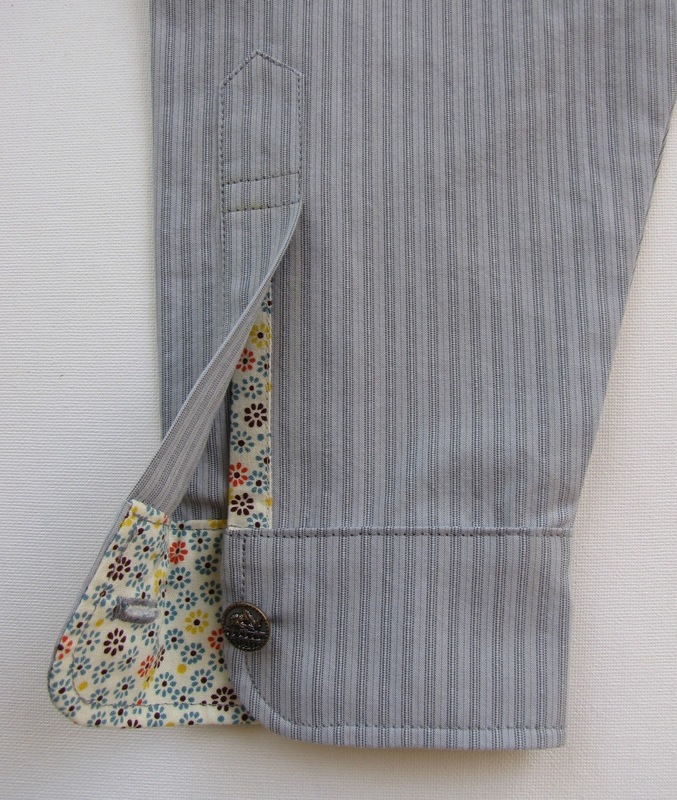 I would dearly love to be able to sew something so lovely for my husband (he certainly doesn't need a tote bag). I am really wowed out by this - the contrast fabric is divine. The contrast makes it! Lovely. Sick Charise, just sick, it is SO FABULOUS PERFECT and on your babe husband it is even better! You rock girl!!! I'd buy and wear that shirt. Great job.